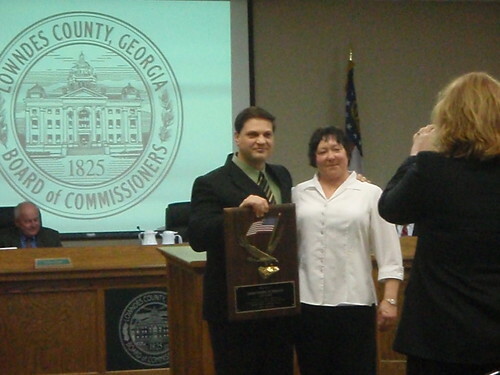 "Elections Supervisor Deb Cox awarded Lowndes County IT Director Aaron Kostyu with a plaque and thanked him and the IT staff for helping the Board of Elections become recognized as one of the five best elections offices in the state." without you on the elections team! Aaron seems to be in the newspaper a lot lately. Here's a writeup about him from December. The Metropolitian Planning Organization (MPO) invited people to a Public Open House last week about prioritization of the 2035 Transportation Plan, so we went to the RDC offices on W. Savannah Ave. and had a look. You can see many of the same materials online. The MPO has a comment form you can fill out and mail to them. There is also contact information on their web pages. They are actively soliciting input. One thing I noticed was that along Cat Creek Road they are proposing several intersection upgrades (at Hambrick Road, New Bethel Road, and Radar Site Road) which look like they would funnel still more traffic through Hambrick Road to Moody AFB. Hambrick Road and Cat Creek Road are not highways. State highways 122 and 129 (Bemiss Road) make a nice fast route from Hahira to Moody. A few improvements at Walker's Crossing (where 122 and 129 intersect) would seem much more appropriate. The MPO could request for the state to do that. Widening of Old US41N is on the list again as a county project, this time as far as Union Road. Several new roads are proposed throughout the city and county as well as widening of many roads with additional travel or turn lanes. You can look over the list of projects and you'll probably find ones to comment on. "You did throw us a bone by limiting the speed limit at 35 miles per hour. But it's not enforceable We asked you to put in speed humps.... Nope. Couldn't do that. Benoit introduced Scott Clark from SolTherm, who will partner with Ambling on The Residences at Five Points. The eco-friendly business out of Asheville, N.C., will oversee the construction of 23 solar panels on the roof of the complex’s clubhouse. Those panels, Clark said, will provide between 50 and 60 percent of the clubhouse’s energy, Clark said. Well, it's a start. But why not solar panels on the roofs of the residences? And why a company out of Asheville when there are at least three companies in Valdosta who could have done that part? How did Texas do that, and how can Valdosta and Lowndes County help Georgia catch up? 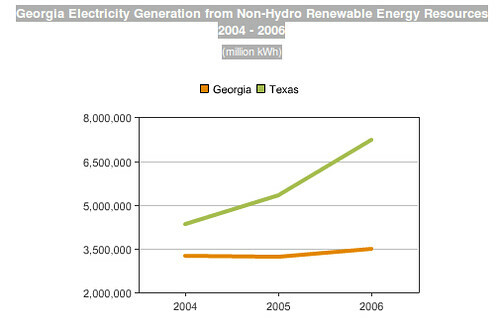 Some years back, Austin, Texas, which has been growing rapidly for decades, needed to find a way to produce more energy. Building a coal plant was not really an option for a city that had long sold itself as a home of green industry. Nuclear had a bad taste because in the 1980s Austin had been an investor in the South Texas Nuclear project, which had been late, over budget, never produced what it was supposed to, and had many political problems. So Austin settled on a new plan: instead of spending big bucks to build a dirty coal plant, use the same money to give rebates to homeowners and businesses for installing solar power. Big rebates: 75%, the largest, and among the first in the country. This made perfect economic sense, producing as much new energy as needed, without coal or nuclear, and distributed where it was needed. The Austin, Texas, city council has approved Austin Energy's solar incentive program, which includes a new approach for commercial, multifamily and nonprofit customers. The new approach saves $2.4 million over the life of the program, according to the utility. 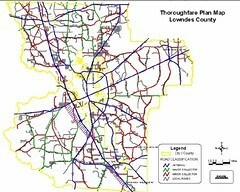 The Valdosta-Lowndes County Metropolitan Planning Organization is holding an open house about its Long Range Transportation Plan. (Not to be confused with the County's Thoroughfare Plan, which has little or no open process.) This Transportation Plan I think will include another attempt to design a bus system; we'll see. I'll be there; how about you? Here's a transcription of the PDF flyer: PARTICIPATE! PARTICIPATE! PARTICIPATE! ...the greenest mill in the U.S. and possibly the least costly to operate. This mill will become the mill of the future instead of the mill from the past. This is at the PCA plant in Clyattville. Through the new boilers, PCA was able to eliminate the use of fossil fuel and run the boilers on renewable energy, Stecko explained. In other words, it's a biomass plant. The article doesn't say whether the biomass is entirely materials that would otherwise have been discarded, nor how efficient it is. Bioengineered Eucalyptus to Replace Pine Trees? ArborGen made a request to the United States Department of Agriculture (USDA) to plant 260,000 flowering genetically engineered (GE) eucalyptus trees over 330 acres in seven states. USDA's Animal Plant Health Inspection Service (APHIS) is processing this request. Several plantations already exist in Florida and Alabama. The tree is Eucalyptus grandis x urophylla. The plant is a cold-hardy eucalyptus that ArborGen is developing for future commercial purposes, mainly pulp for paper. Update: Seth says Eric Cornwell says earliest March 15 and latest probably May 1. I received word from the EPD Air Branch Manager, Eric Cornwell, that they have decided that they *WILL*, now, be working to host a public hearing in Valdosta (and possibly a Q & A session prior to a hearing). They expect the public hearing to take place sometime at the end of March (law requires a 30 day notice before a meeting takes place). Eric informed me that he would reply to all the emails he has received with the hearing information, and as well would be putting an ad in the Valdosta Daily Times. The plant's air quality application is supposed to be online at EPD. I can't find it there, but here it is hosted on the LAKE site.